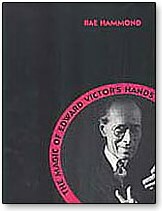 Edward Victor was one of the greatest magicians who ever lived, who affected the work of almost every close-up magician working today. Dai Vernon and Ed Marlo, among many others, owed a major debt to the work of Edward Victor. His creations include the famous Eleven-Card Trick, which inspired Vernon's Spellbound and Coins and Champagne Glass. Victor's sleights inspired Tilt, Convincing Control and many others. Edward Victor's story and magic are fascinating. This enormous book brings together a fascinating collection of magic and biography. It contains most of Edward Victor's many tricks that he contributed to periodicals and other books, his marketed items as well as unpublished routines from his private notebooks. It traces the story of his life with many unique photographs and other bits of memorabilia that recall the glory of a golden age. There is even a chapter on his Shadowgraphy. There are over 250 drawings by Joseph K. Schmidt and almost 100 photographs. The book contains 250 pages and is hardbound.